Remove packet of giblets from inside the chicken cavity. Season outside and inside with 2 Tablespoons of seasoned salt. I had no idea that they sold chickens with thermometers! how cool! I think the idea of creating a rack with some slices of onions is totally ingenious! I just combine those dry ingredients, oil up the chicken, and pat the seasoning of thyme salt and pepper into the chicken. It’s a bit more herby tasting, and thyme is a lovely herb on fowl. Hi Will, thanks for the recipe! I’ll try it next time I roast a chicken. BTW The onion rack gives the chicken a wonderful flavor and the cooking aromas are to die for! Cheers! I have seen fish recipes like that (which use vegetables to make a “rack” underneath), but never chicken. What a great idea! Kathy, pretty clever food blog. Thanks for the entry. If your chicken doesn’t have a thermometer in it, but you have a probe thermometere, what internal temp would you cook to? My thermometer says poltry needs to be 190, but that seems a little over done. I never knew that you can buy chicken with thermometers stuck to it ! lol ! i think that the onions give the chicken some flavor and that its a great idea ! =] thanks for the recipe ! Hi Eman, if your chicken does not come with one, you can buy those thermometers separately. They are inexpensive which is a good thing as you can only use them once. I think the video was straight and to point. It told me exactly what I needed to know and was very helpful. I will come to the website again. I like the idea of a video. In the summertime, when it is too hot and humid to turn on the oven, I often buy an already roasted chicken in the grocery store. 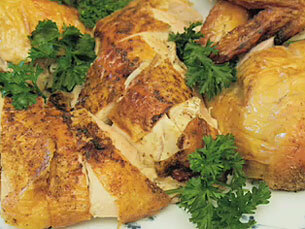 Once the weather turns crisp, there is nothing better than the smell of roasting chicken in the oven! The problem with those plastic pop-up thermometers is that they don’t pop up until they hit between 176 and 185 degrees, so once your chicken rests chances are it will be up to 195 or so, which is overcooked. I like the probe thermometers, like the Polder. The probe is on a cable, and stays in the bird while you are cooking it, and reports the temperature to the “brain,” which you can attach via magnet to the oven door. Set the alarm to go off and 165 degrees, and when it does, take the bird out and rest it. You will never overcook a bird again. Thanks Kelly for the great info and suggestions! Beginner cooks often hesitate in making investments in kitchen utensils that may or may not get used that often. A good thermometer is essential for all cooks. It may seem daunting, but with this simple recipe, you CAN roast a chicken!